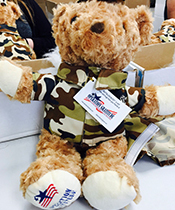 What Happened: On Saturday, April 13, a group of SNHU community members supported Operation Gratitude with package assembly, letter writing, stuffing teddy bears for children of deplyed service members, and connecting with each other. Operation Gratitude sends hundreds of thousands of care packages to those who serve. Site leader Emily DeVito said "SNHU students always bring the best energy to the table!" The group had a great day supporting our service members and their families. Stay Connected: SNHU staff member Emily DeVito was your volunteer project leader for this event. If you have general questions about SNHU Global Days of Service, please contact the Office of Alumni Engagement. And, check out more ways to get engaged with the SNHU community!